This is a psalm of David. He cries out to Yahweh; he needs God’s help and he needs it in a hurry. He has no incense to burn, no sacrifice to offer, but he asks that his prayer be heard and answered just as if he did. What is striking about this is that he does not first ask, “Set a guard over me,” or, “Keep watch over the door of my heart.” No, his primary request and the thing that concerns him most is his mouth and his lips — his words! He realizes that it is these, above all else, that needs God’s attention. Words are very powerful and vitally important. The author of Hebrews says, “By faith we understand that the worlds were framed by the word of God” (Hebrews 11:3). In the beginning, when God saw that darkness was over the face of the deep, He spoke into existence what was needed: “Light, be!” Words are the basis of reality. When God formed man from the dust of the ground, He breathed the breath of life into his nostrils and man became a “living being.” Targum Onkelos, an ancient translation of the Hebrew Scriptures into its cousin language, Aramaic, says that man became a “speaking spirit.” Man, made in the image of God and created to be like Him, has the ability to speak words just as God does. Indeed, we were created to speak in agreement with the words of God. This does not mean, however, that he has nothing to say about the wicked and their deeds, but he says them to God: “For still my prayer is against the deeds of the wicked” (v. 5). Indeed, his prayer is not so much against the wicked themselves as it is against what they are doing. In fact, he recognizes that these are people being led into opposition by treacherous leaders. When such leaders are thrown over — sometimes quite literally, and sometimes by the people themselves — there will be a vacuum. Let that vacuum be filled with wise words, life-giving words, words that agree with the words of God. That is what David wants to bring, instead of words spoken in anger and haste. “Their judges are overthrown by the sides of the cliff, and they hear my words, for they are sweet” (v. 6). Perhaps that will bring his enemies to their senses and lead to reconciliation. However, a positive result will not come about by a mouth that is volatile or lips that are indiscreet. Set a guard and keep watch over them, O LORD. The other day I ran a brief search on “law” and “prophets” in the New Testament for an overview of how they relate to Jesus. Used together, “law” and “prophets” indicates the totality of the Hebrew Scriptures. So here is a short rundown on how the New Testament understands the relationship between Jesus and the Old Testament. The Law and the Prophets led up to the days of John the Baptist, who came in the spirit and power of Elijah. He was the forerunner who prepared the way for Messiah, preaching a baptism of repentance. Jesus, after He was baptized by John and tested in the wilderness, began His ministry preaching the “gospel of the kingdom of God,” saying, “The time is fulfilled, and the kingdom of God is at hand. Repent, and believe in the gospel” (Mark 1:14-15). Since that time, the kingdom of God has been forcefully advancing, and people have been pressing into it, forcefully laying hold of it by faith. In the Sermon on the Mount (which I call The Sermon of Heaven on Earth), Jesus said, “Do not think that I came to destroy the Law or the Prophets. I did not come to destroy but to fulfill” (Matthew 5:17). Jesus does not set aside the Law and the Prophets; He is the promised King and Messiah who assures us that everything God promised in the Law and the Prophets will be fulfilled. This is the certainty of heaven on earth. The disciples, sent out as apostles, testified of this throughout the world, making disciples of all nations, teaching them about King Jesus, the one who possesses all authority in heaven and on earth, and baptizing them in the name of the Father and of the Son and of the Holy Spirit (Matthew 28:18-20). They were not setting aside the Law and the Prophets but testifying of its fulfillment. In the book of Acts, for example, we discover Paul’s modus operandi, when he announced the good news in the synagogue at Antioch: “And after the reading of the Law and the Prophets, the rulers of the synagogue sent to them, saying, ‘Men and brethren, if you have any word of exhortation for the people, say on’” (Acts 13:15). Being invited to teach on the Law and the Prophets, Paul stood up and began preaching how Jesus is the fulfillment of the Hebrew Scriptures and what God was doing through Israel (Acts 13:16-41). Many devout Jews, as well as Gentile proselytes to the Hebrew faith, believed the good news he brought (vv. 42-44). On another occasion, when Paul was accused of profaning the temple and stirring up sedition among the Jews, he made his case before the Roman procurator, Felix. He denied the charges and said, “But this I confess to you, that according to the Way which they call a sect, so I worship the God of my fathers, believing all things which are written in the Law and in the Prophets” (Acts 24:14). His preaching was not an incitement to insurrection among the Jews but a call for them to believe the Torah and the Hebrew Prophets concerning Messiah. At the end of the book of Acts, we find Paul at Rome and under house arrest, doing what he had always done: preaching about Jesus and how the Law and the Prophets and the kingdom of God, all come together in Him. “So when they had appointed him a day, many came to him at his lodging, to whom he explained and solemnly testified of the kingdom of God, persuading them concerning Jesus from both the Law of Moses and the Prophets, from morning till evening” (Acts 28:23). Then, in his letter to the believers at Rome, Paul demonstrates how the righteousness of God is revealed apart from the Law, through faith in the Messiah, Jesus — and the Law and the Prophets testify to this! “But now the righteousness of God apart from the law is revealed, being witnessed by the Law and the Prophets, even the righteousness of God, through faith in Jesus Christ, to all and on all who believe” (Romans 3:21-22). One day a Pharisee who was particularly skilled in the Law of Moses came to test Jesus: “Teacher, which is the great commandment in the Law? Jesus answered, “You shall love the Lord your God with all your heart, with all your soul, and with all your mind. This is the first and great commandment. And the second is like it: You shall love your neighbor as yourself. On these two commandments hang all the Law and the Prophets” (Matthew 22:37-40). On the night of the Last Supper, as He was preparing the disciples for what was about to happen, Jesus said, “A new commandment I give to you, that you love one another; as I have loved you, that you also love one another. By this all will know that you are My disciples, if you have love for one another” (John 13:34-35). “This is My commandment, that you love one another as I have loved you” (John 15:12). The commandment that fulfills the Law and the Prophets is now possible for us because of Jesus, who fulfills the Law and the Prophets on our behalf. He has sent the Holy Spirit — baptized us with the Spirit — the same Spirit by whom He was anointed with power (Acts 10:38). Paul writes about the fruit of the Holy Spirit in us: love, joy, peace, patience, goodness, gentleness, meekness, faithfulness, self-control — in other words, the character of Jesus — something the Law of Moses could never produce in us (Galatians 5:22-23). Everything God was doing with Old Testament Israel through the Law and the Prophets is fulfilled in the kingdom of God now present in the world, and in its king, Jesus the Messiah, and through His commandment, “Love one another as I have loved you. Christians in the West often think of salvation in individual terms. 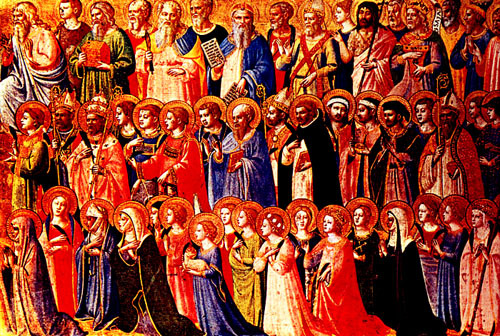 When I was in Bible college, we used to hand out little leaflets that asked, “Am I Going to Heaven?” It was very individualistic and pretty much oriented to the next life. It was good as far as it went and I am very thankful for all who came to know Jesus through it. Salvation in the Bible, however, is not merely an individual thing nor is it just about what will happen to you when you die. God’s plan has always been about redeeming a people out of all nations. God’s promise to Abram was not to bless just individuals but families and nations through him: “In you all the families of the earth shall be blessed” (Genesis 12:3). God’s purpose for the children of Israel, the descendants of Abraham, was that they would be a “kingdom of priests and a holy nation” (Exodus 19:6). The role of a priest is to represent the people before God and God before the people. Israel’s role, as a holy nation and a kingdom of priests, was to represent the nations before God and God before the nations, that all the families of the earth might be blessed. It is in the context of God’s people, then, that the psalm writer thinks of salvation. It is about the people of God, His chosen ones, His nation, which are His inheritance. The favor of God, the benefits and the rejoicing belong to them as a people. 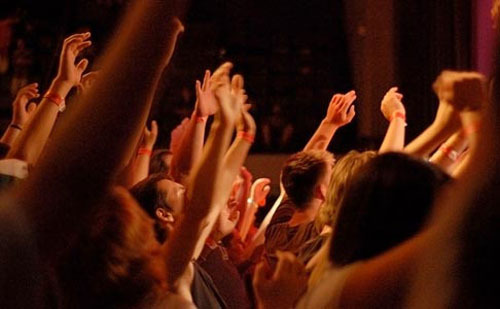 The psalm writer wants to participate in it all, not apart from the people of God but with them. In the Old Testament, the people of God were identified with the Law of Moses, the Temple and the land of Israel. 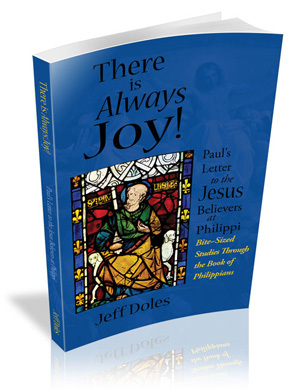 In the New Testament, in Jesus the Messiah, salvation is offered apart from those things. The new law is the commandment of Jesus to love one another; the new temple is the people of God, the body of Messiah; the new land is the entire world. “Go into all the world and preach the gospel [proclaim the good news] to every creature,” Jesus said (Mark 16:15). “Make disciples of all the nations, baptizing them in the name of the Father and of the Son and of the Holy Spirit, teaching them to observe all things that I have commanded you” (Matthew 28:19-20). Now the people of God are identified by faith in Israel’s messiah, Jesus. We were created for fellowship, not only with God but also with each other. Jesus said that all the Law and the Prophets hang on these two commandments: “You shall love the Lord your God with all your heart, with all your soul, and with all your mind. This is the first and great commandment. And the second is like it: You shall love your neighbor as yourself” (Matthew 22:37-39). So our salvation is not just as individuals but as part of the people of God. It is together that we know the favor of God, see the good He has for His people, rejoice in His glad nation and share with His inheritance — and indeed, we are His inheritance. So these days, I do not think of salvation so much in terms of “Am I Going to Heaven?” That is really just part of a larger question and is answered within that larger question: “Am I Part of the People of God?” It is together with the community of faith, the people of the Messiah, Jesus, that we experience salvation and participate in the benefits of God, not only in the life to come but in this present one, as well. The first group was from among those who had just been fed by the miraculous multiplication of loaves and fishes. Afterwards they watched the disciples gather up the leftovers, twelve baskets full of scraps from what had originally been five barley loaves. “This is truly the Prophet who is to come into the world,” they said (v. 14), a reference to a prophecy from Moses about the Messiah who would come and rule over Israel. These men were tired of the Roman oppression that had plagued Israel and were ready to do something about it. When they witnessed the miracle of bread Jesus performed in the wilderness — think Moses and the manna in the wilderness — they intended to “take Him by force.” The Greek word, harpazo, means to seize violently. They wanted to press Him into their political agenda, to use Him for their own plans. 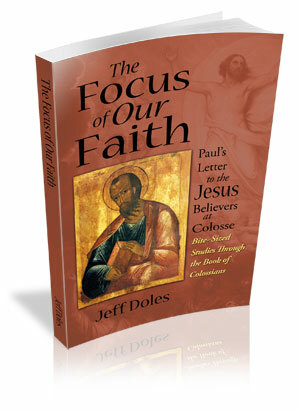 Jesus, however, perceived what they were about and would not allow Himself to be squeezed into their purposes. The second group was the disciples. When Jesus went up into the mountain, the disciples went down to the sea where they got into a boat and set out toward Capernaum. It was now evening and Jesus had not yet come down. As the darkness fell, a strong wind came and the sea rose up. They had had been rowing hard for about three or four miles when they saw Jesus walking on the water, heading toward the boat. 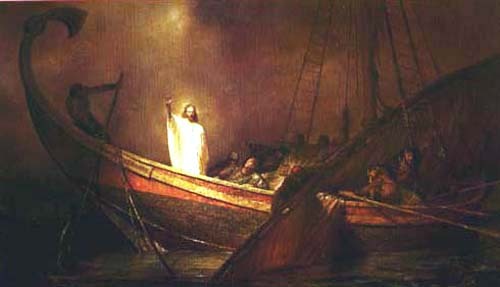 They were fearful, but Jesus comforted them, saying, “It is I; do not be afraid.” Then they “willingly received” Him into the boat. The Greek word for “receive” is lambano. It means to “take hold,” not seize violently or take by force, but as something that has been offered. Jesus had come and made Himself known to them. He offered them His presence. They gladly embraced this opportunity and took hold of Him, welcoming Him into the boat. Now let’s compare the two groups. The first one wanted a kingdom. Jesus came announcing the kingdom of God: “The time is fulfilled, and the kingdom of God is at hand” (Mark 1:15). And indeed, Jesus came too be king. But the first group wanted to make Jesus and the kingdom all about themselves, their agenda, their timetable. They wanted it when and where and however it suited their own concerns. 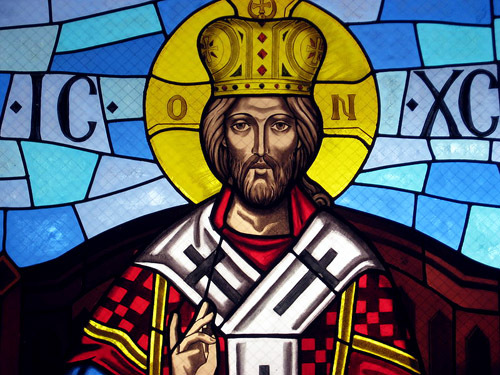 They would take Jesus by force, if necessary, to make Him be the king. But that was not a decision for them to make, and Jesus would not be their puppet. The second group, the disciples, also wanted to see the kingdom. They, too, had witnessed the miracle of bread in the wilderness — they had been a part of it! They saw Jesus up close. They loved Him, followed Him, did whatever He told them. They did not try to force Jesus into anything. They understood that the kingdom, whatever it was, would be about Him and would be worth everything they had. They might have been reluctant to leave Him behind at nightfall and were certainly afraid when they saw His shadowy figure walking toward them on the water, but they were very glad when He identified Himself to them and they received Him into the boat. The difference, then, is this: The first group wanted the kingdom; the second group, the disciples, wanted the King. It is the difference between taking hold by faith and trying to take hold by force. King Jesus will always respond to faith. Asking and receiving are connected. We think of asking as active, that is, something we do. And so it is. But we often think of receiving as passive, that is, something that happens to us or is done for us. For example, someone might say, “I received a blow to the head.” He did not seek it, did not want it, did not cause it; it was simply something that happened to him. He was passive, sitting quietly, minding his own business when, suddenly — wham! — he was hit on the head. Jesus has something very important to teach is about prayer: “Everyone who asks receives.” He is not speaking of something active followed by something passive. No, both the asking and the receiving here are in the active voice. That is, they are both about something we do. The Greek word for “receive” is lambano. It means to take or get hold of something, as if with the hand. Now, it does not mean to take something by force, as if to wrench it away from someone else. There is a different word for that. Rather, it is about things that belong to you or have been offered to you. And that is the case here. In Matthew 7:7, Jesus says, “Ask and it shall be given to you.” When we ask (active voice), something is given (passive voice). In other words, when we ask, something is offered to us, and that means we have a right to take hold of it. A young man is working his way through college and needs a car. He goes to his father for help. Dad agrees (he’s a nice guy) and arranges to get him a sturdy little sedan. The son believes his father and now his expectation is that the car his father promised is his. He has received his father’s answer; that is, he has taken hold of it and the issue is now settled. There may be a brief time of waiting before the car arrives while the father works out the particulars, but the son has asked and has already received what he asked — he has taken hold of his father’s answer. “Ask and it shall be given to you,” Jesus said, “for everyone who asks receives.” Asking and receiving work together. But when do we receive what we have asked? Jesus answered that on another occasion: “Whatever things you ask when you pray, believe that you receive them, and you will have them” (Mark 11:24). Notice He does not say, “Believe that you will receive them” (future tense), but “Believe that you receive them” (present tense). The NASB translates it as “Believe that you have received them” (past tense, completed action). In other words, the receiving comes at the time of asking, when you ask in faith. Faith is very important when we pray. It is how we receive, or take hold of, what we are asking for. The author of Hebrews says that “Faith is the substance of things hoped for.” (Hebrews 11:1). The Greek word for “substance” is hypomone and refers to the underlying reality of a thing. In some ancient Greek documents, this word was used to refer to the title-deed of a piece of land. The word for “hope” speaks of expectation or anticipation. So faith is the underlying reality, the title-deed of what we are fully expecting to see. Jesus says that when we ask, it will be given to us. “If you then, being evil, know how to give good gifts to your children, how much more will your Father who is in heaven give good things to those who ask Him!” (Matthew 7:11). Jesus does not lie; when He says the Father will give it to us, then the Father will give it to us. We can fully expect that we will have it. Indeed, by faith we possess the substance of it, the underlying reality, the title-deed for it. 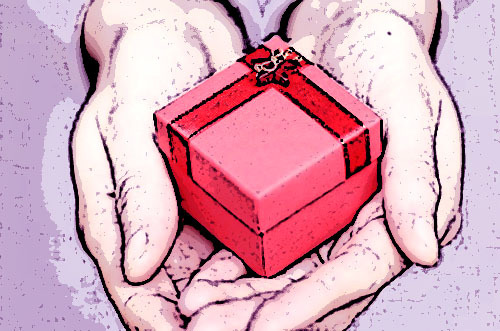 Now let’s put this all together, with the understanding of what it means to receive and how we actually do it. Ask and it shall be given to you, for everyone who asks takes hold. So whatever you ask when you pray, believe you take hold of it, and you will have it. Nobody likes turbulence. When things get rough, it is natural to quickly engage all of our senses to assess the situation. Often we panic, because we believe our senses are giving us the truth instead of just facts. There is a difference: facts change; truth does not. It may be a fact that today there is a storm on your horizon, but the truth is that it may be gone by morning. What we do in those difficult moments is very important. It is the difference between being driven by the facts and led by the truth. David begins Psalm 31 with a declaration of trust, “In You, O LORD, I put my trust.” And a request, “Let me never be ashamed; deliver me in Your righteousness” (v. 1). He affirms that God is his rock, his fortress, his strength (vv. 3-4) and entrusts himself completely to Him, “Into Your hand I commit my spirit,” and follows with this a confident assertion, treating his request as already answered: “You have redeemed me, O LORD God of Truth” (v. 5). The troubles he has been experiencing are not new but have been going on for a while, ebbing and flowing. But he has always come out on top. “You have known my soul in adversities, and have not shut me up into the hand of the enemy; You have set my feet in a wide place” (v. 7-8). Now trouble has arisen again, and stronger than ever, it seems. Or maybe it just feels stronger because David is worn out: “My eye wastes away with grief, yes, my soul and my body! For my life is spent with grief, and my years with sighing” (vv. 9-10). The voice of guilt takes a toll on him: “My strength fails because of my iniquity, and my bones waste away” (v. 10). Not that there is some specific transgression in his life from which he has not yet repented, but the memory of sins past and the tendency of human nature haunt him. He feels the reproach of enemies and friends alike, and that he has become repulsive to all who know him, or just know about him (v. 11). He is forgotten and broken, slandered and surrounded (vv. 12-13). Yes, he had been in a panic, and had spoken out of anxiety, saying something that on better days he knew was not true. He had not been cut off from before the eyes of Yahweh — not by his circumstances, not by his enemies, not even by Yahweh Himself. Fear held him for a brief time and might have swallowed him up, except that he returned once again to words of faith, speaking light in the dark. “I trust in You; You are my God. My times are in Your hand.” God heard his prayer and his cry, which is to say that God answered and delivered him, just as He had intended all along. You see, there is very often a period of waiting between the time we first pray and entrust a matter to God and the time the answer shows up. And sometimes, between “Amen” and “There it is!” we are tempted to become impatient and lose heart. But that time differential (I hesitate to call it “delay” because that assumes we always know what the correct timing should be) does not mean that God has not heard or has not already arranged what is needed. 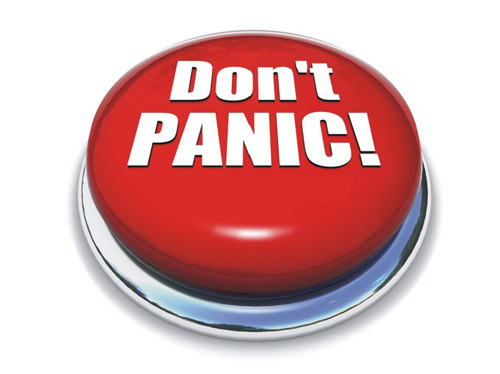 Don’t be hasty and speak out in the panic of the moment. Keep your mouth shut and meditate on the faithfulness of God, who has never forgotten your or cut you off from before His face. “Be of good courage, and He shall strengthen your heart, all you who hope in the LORD,” is the advice David gives at the end (v. 24). Then let the words of faith return once again to your lips. All will be well. This is a promise God made to Israel in one of her darkest hours, when she was divided and taken into captivity because of her idolatry. There would be a return, a restoration, a rebirth. The past would be past and God would create a new relationship with her. “David” would be king over them. David was long dead by this time, but the reference here is to the Son of David, that is, the “Anointed One” God promised would reign on the throne over Israel. As David was literally a shepherd, so his descendent would also be a Shepherd over them. There would be a return to the land where they would dwell forever. God would make a new covenant with them, a covenant of peace — shalom, the wholeness that comes from God — and it would be eternal. God would establish His sanctuary, His holiness, among them. His tabernacle, His divine dwelling place, would be with them and they would be His holy people, set apart for His pleasure and purpose. They would enjoy special relationship with God, fellowship with the Divine. This promise is fulfilled in Jesus the Messiah, the Son of David, who is called the Good Shepherd. He is the mediator of a new and better covenant, which is established on better promises (Hebrew 8:6). He is not only the High Priest of that covenant; He is the sacrifice upon which it was based. On the night before He was crucified, He blessed the bread of the Passover table and gave it to the disciples: “This is My body which is given for you.” Then He took the cup and said, “This cup is the new covenant in My blood, which is shed for you” (Luke 22:19-20). Jesus is the tabernacle of God. He is the Word who “became flesh and dwelt among us” (John 1:14). 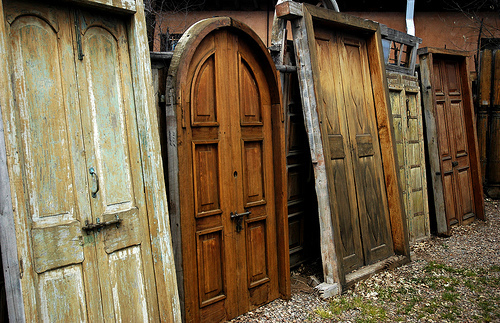 The Greek word for “dwelt” (skenoo) relates linguistically to the Hebrew word for “tabernacle” (mishkan). Literally, the Word became flesh and “tabernacled” among us (see The Shekinah Dwelling). “The nations also will know that I, the LORD, sanctify Israel, when My sanctuary is in their midst forevermore.” The promise was for Israel and the land God gave to Jacob, but this would be a witness to all the nations of the world that God has created a people on earth and dwells among them. Indeed, the promise was for the sake of the nations, for God created Israel to be not only a holy nation but also a “kingdom of priests” (Exodus 19:6). That is, they were to bring the blessing and promise of God to all the nations. We find this fulfilled in the New Testament. Before He ascended to His throne at the right hand of the Father, Jesus came to the disciples and said, “All authority has been given to Me in heaven and on earth. Go therefore and make disciples of all the nations, baptizing them in the name of the Father and of the Son and of the Holy Spirit, teaching them to observe all things that I have commanded you; and lo, I am with you always, even to the end of the age” (Matthew 28:18-20). It was not just for the land God gave to Jacob, for Abraham was heir to the whole world (Romans 4:13; the Greek word for “world” here is kosmos). And it was not just for ethnic Israel but all the nations were to be discipled and baptized and instructed. However, this does not mean that the nations would receive the promise in addition to or apart from Israel — and certainly not instead of Israel. But, in Paul’s metaphor, they are grafted into the root stock of Israel, to be partakers of the blessing and promise of God as part of Israel (Romans 11:16-24). So the tabernacle of God, Jesus the Messiah, comes to abide all over the world, in every nation. All who believe Him receive the promise and become part of the sanctuary, the holy people with whom God dwells. And all the nations will know. After the resurrection and before He ascended to His throne at the right hand of the Father, Jesus was with the disciples, “being seen by them during forty days and speaking of the things pertaining to the kingdom of God” (Acts 1:3). His whole ministry had been about the kingdom of God. Jesus came preaching the gospel of the kingdom of God: “The time is fulfilled, and the kingdom of God is at hand. Repent, and believe in the gospel” (Mark 1:15). He promised the disciples, “Do not fear, little flock, for it is your Father’s good pleasure to give you the kingdom” (Luke 12:32). But now, He spoke about the promise and the kingdom in a different way. Jesus did not ignore their question; He answered it in a way they were not expecting. They wanted to know about the timing of the kingdom. The Greek word for “time” here is chronos, that is, chronological time, the sequence of time measured by calendars and clocks. He did not answer with regard to the chronos of the kingdom. There is another Greek word for time, kairos, which refers to the fullness or ripeness of time, the acute moment of significant fulfillment. But Jesus did not speak to them of kairos, which is translated here as “seasons.” He answered, instead, with regard to the nature and the power of the kingdom. They wanted to know when the kingdom would come; Jesus told them how the kingdom would come. It would come in the power of the Holy Spirit, the same power by which He had performed all His kingdom miracles. When they understood the how of the kingdom, they would know the when. They would be the witnesses, bringing the evidence of it to all the world and testifying about Jesus. Jesus’ ministry was about the kingdom; the ministry of the Holy Spirit would be about the ministry of Jesus. The promise of the Father was about the Spirit — and the kingdom of God. 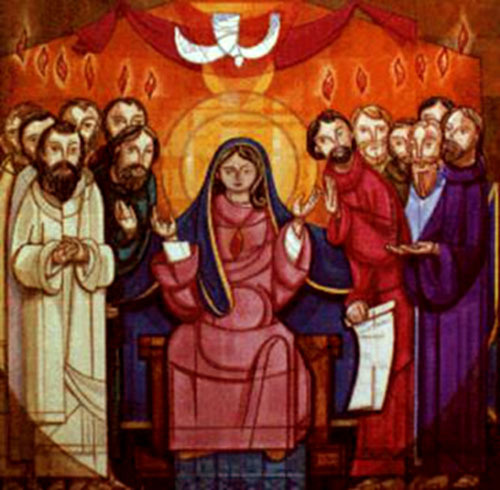 The Church season of Pentecost celebrates the fulfillment of that promise. First Corinthians 15 is known as the resurrection chapter, because Paul preaches how important the bodily resurrection of Jesus the Messiah from the dead is to the Christian faith and the salvation of the world. 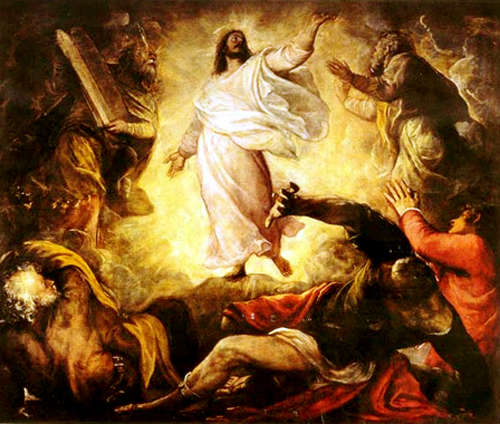 But it is also a chapter about the Ascension, the Second Coming and the ultimate fulfillment of all things. They all flow together. Adam, the first man of the old creation, died because of his rebellion against God, and all who are in him are subject to his death. But Jesus is the firstfruits, the first Man of the new creation, by whom has come the undoing of death! 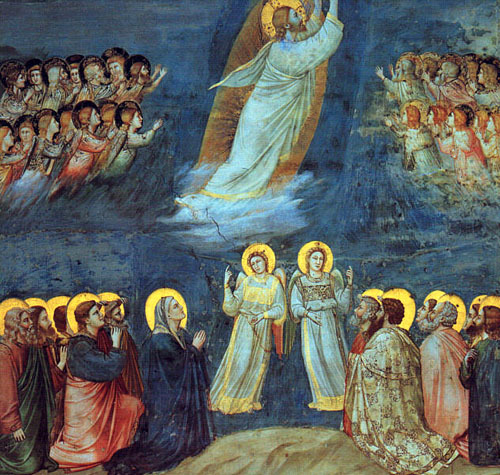 Forty days after His resurrection, Jesus ascended to heaven to be seated at the right hand of the Father, where “He must reign till He has put all enemies under His feet.” The ascension was not merely the return of Jesus to heaven; it was an enthronement. The Father is now bringing all things under submission to Him. This is what God had promised in the Old Testament. “The LORD said to my Lord, ‘Sit at My right hand, till I make Your enemies Your footstool’” (Psalm 110). The Jews of Jesus’ day understood this to be a reference to Messiah, but Jesus used this Scripture to demonstrate that Messiah, the Son of David, must also be the Lord of David (Matthew 24:41-46). God intended man to have dominion over creation. Adam failed because of his disobedience to God. But what was lost to us in Adam has been restored to us in Jesus the Messiah, who is fully human as well as Son of God. When He ascended to the throne of heaven it was in His humanity as well as His divinity. King Jesus is now putting an end to “all rule and all authority and power,” that is, to everything that opposes God in the world. This work will find its completion when He comes again. Death, “the last enemy,” will be destroyed and all those who belong to Jesus will be raised from the dead—the full harvest, of which Jesus is the firstfruits. The kingdom of God will be here in all its glory and power, and the will of God will be done on earth exactly as it is in heaven. Then Jesus will deliver it to the Father, that God may be glorified in everything.